The Dan Armstrong Purple Peaker (and Yellow Humper, the sister version tuned for bass guitar) used two peaks for bass and treble boosts. The resulting effect is interesting, but not very flexible. We chose to apply the same concept, but with a modern approach that would provide added control to the user. 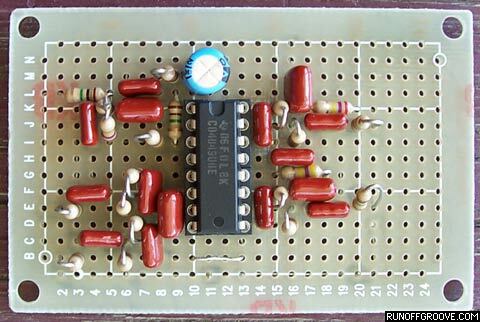 We chose a 4049 IC as the foundation of the circuit. The 4049 has been used in distortions, such as the Double D and 3 Legged Dog, for its tube-like clipping. The graceful distortion, plus the number of available stages made the 4049 an excellent candidate. 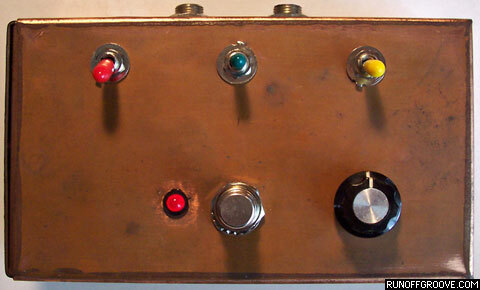 The input gain stage compensates for the signal level variation introduced by the later filter stages. To reduce the parts count, we used bridged-T notch filters where the Purple Peaker used twin-T filters. 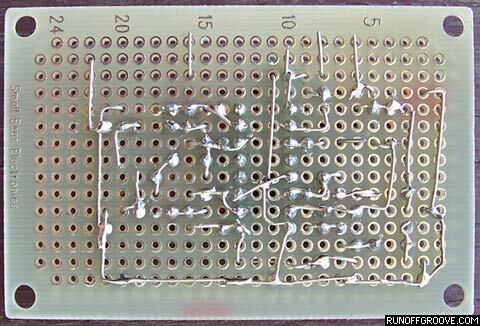 Preceding each peak stage is a parallel resistor and capacitor network. 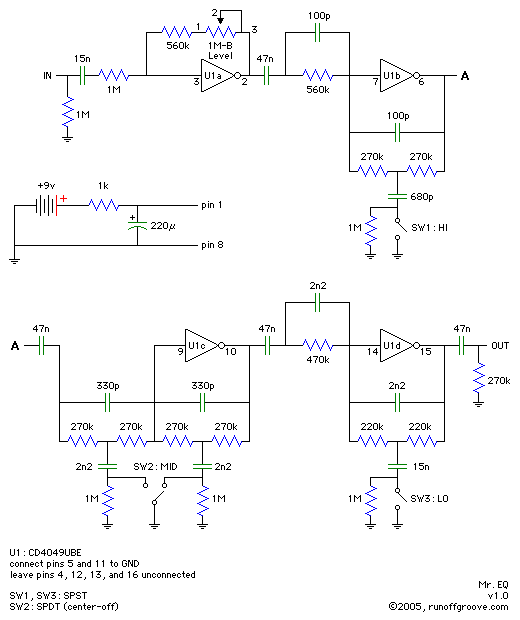 This forms a high-pass filter that preserves the treble content through the bridged-T notch filter. For the peaks' center frequencies, we began with the modified Purple Peaker values and tuned them a bit lower after many listening tests. 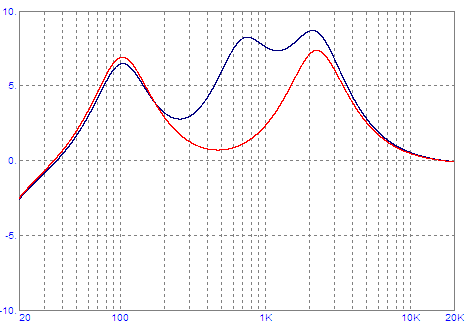 The three peaks are tuned to 100 Hz, 700 Hz and 2.1 kHz. The LO peaks works well for adding more bass to a guitar or bass. The MID peak functions as a relative treble peak for a bass guitar, like the rare Yellow Humper. As expected, the HI peak adds a crisp sheen to a guitar (but has no effect on a bass). Each peak, when activated, provides a 7 dB boost, except for the MID stage that can also produce a 7 dB cut. We included this feature since a true midrange cut differs audibly from the relative mid cut produced by the bass and treble peaks (as implemented by the Purple Peaker). 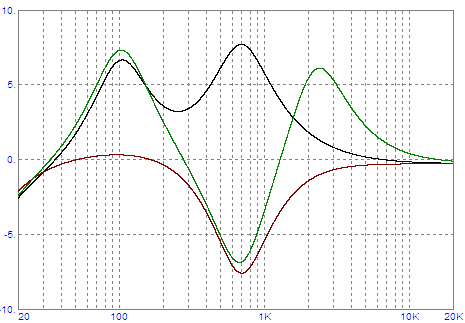 There are 11 different equalization curves in total, excluding the flat setting with all bands off. We suggest you experiment with combinations of Mr. EQ settings and your pickup switching to determine the settings that are best for your gear and playing style. Mr. EQ by runoffgroove.com is licensed under a Creative Commons Attribution-NonCommercial-ShareAlike 3.0 Unported License.